Now, Aquarius 6-Pisces 8 and Taurus 7-Gemini 9 really do look adjacent. Put distance between them, or connections between them, or players will be confused. How is this for distinction between those that are close... as well as fixing the ares/libra strong points? No, he's right. They're too close together; they touch or nearly touch, which makes them look adjacent. 1) I'm not really loving these rifts, but for gameplay purposes I can assume that you'll have some way of keeping these constellations separate by the time you get to graphics. 2) Do the wormholes have the same troop decay as the other territories next to the black holes? 3) You've still got to come up with some neutral scheme or reinforcement scheme that you like, that's fair, and that works with the current XML capabilities (See this thread for an inventory of usable XML tags). For the last one, I still recommend putting down 1- or 2- troop neutrals on every other territory; that would make it so the huge bonus areas are easier to take, and it would make each player start with a smaller territory bonus. Evil DIMwit wrote: 1) I'm not really loving these rifts, but for gameplay purposes I can assume that you'll have some way of keeping these constellations separate by the time you get to graphics. It seems unclear to me so perhaps you should add "including wormholes" to the legend. If you distribute them evenly it'll probably be all right. That would mean conquering anything near a full constellation would take a while. any more input on the idea of starting points instead of random territs? Are you suggesting a conquest-style map, with 12 starting points and the rest of the map starting neutral? ender516 wrote: Are you suggesting a conquest-style map, with 12 starting points and the rest of the map starting neutral? Evil DIMwit wrote: 2) Do the wormholes have the same troop decay as the other territories next to the black holes? a big thumbs-up to the wormholes! aries and libra are still the easiest bonuses, but the difference between them and say, cancer, in terms of ease of holding is far less than before. ditch the conquest map idea, which requires a lot of care and discussion as to the 8 start positions. the wormholes do more to balance the existing map than u might think. as u say, every star that connects to either a wormhole or to the black hole ought to decay. u need to show this visually somehow, for example by giving a purplish inner glow to (or by having bright rays emanating from) each decaying star. i favour each decaying star starting neutral, so that the dust bowl problem of some unlucky players losing 7 or 8 troops instantly on their first turn doesn't happen. if u do this, then i think u don't need any other neutral starts on the board (other than the black hole and wormholes, obviously). i assume that u intend for each wormhole to reset to only 1 or 2 killer neutrals each turn since, if u attack via a wormhole, u must go thru 2 killer neutrals to reach another star. aquarius, taurus and leo look a bit undervalued at +5. i'd raise the latter two to +6, with aquarius being +7 (it's the only bonus where a wormhole is attached to a star that wasn't previously a border star). I agree with ian on all accounts. The wormholes add some much needed gameplay pizazz that wasn't there before. Like he said, include a decay for the stars bordering the Black Hole and the wormholes as well and I think you'll be good to go for gameplay. That being said, your "impassable rifts" look extremely stretched and distorted, though I imagine this will be fixed in Graphics. Now, are yall suggesting that those attached to the wormholes decay as well? yes and yes (if the stars beside the wormholes don't decay, then the wormholes become a method for aries and libra to attack the large bonuses, which is the opposite of what we want). is pisces 12 connected to taurus 9? there seems to be a faint white line that joins them together, but i'm not sure that it's meant to be there. it must be my eyes then! looking closely, i see no line there after all. as an additional bonus adjustment, try increasing scorpio to +10, since it's connected directly to 5 other constellations (maximum elsewhere is 3), as well as having to be defended at 7 points (the most elsewhere is 5). to create some space for improving the layout of the legend, u can ditch the bonuses for fire, air, water and earth. they're unlikely to be targetted by anyone in any game. iancanton wrote: try increasing scorpio to +10, since it's connected directly to 5 other constellations (maximum elsewhere is 3), as well as having to be defended at 7 points (the most elsewhere is 5). iancanton wrote: aquarius, taurus and leo look a bit undervalued at +5. i'd raise the latter two to +6, with aquarius being +7 (it's the only bonus where a wormhole is attached to a star that wasn't previously a border star). So aside from these bonus changes, and updating the Legend; anything else I should do for the next update? i'm happy with what u've done (plus those bonus and legend changes, of course). let's call in the map surveyors! You should add in the retrieved 13th zodiac sign, haha. AndyDufresne wrote: You should add in the retrieved 13th zodiac sign, haha. Dammit I was just gonna post that.......you beat me to it. What does it mean when you say "The black hole decays connected by 1 including the wormhole"? Perhaps the wording should be "Locations adjacent to the black hole decay by 1 each turn." ender516 wrote: Perhaps the wording should be "Locations adjacent to the black hole decay by 1 each turn." 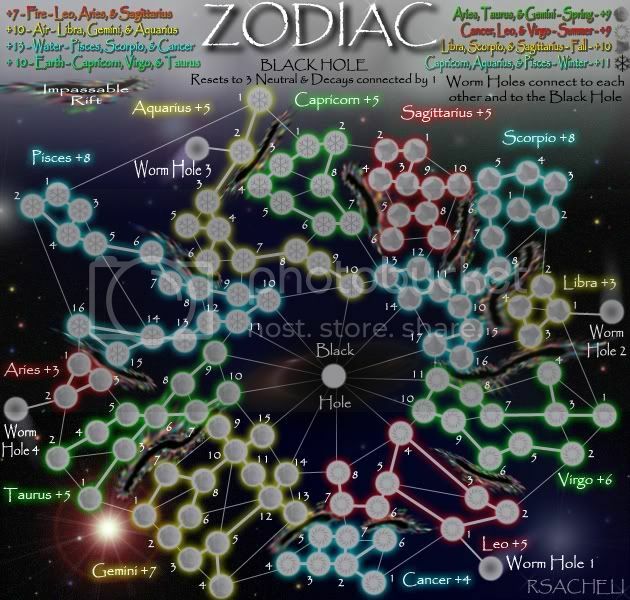 I DISAGREE WITH THE 13th Zodiac and will NOT include it!